Raytec Systems is a proud partner of Samsung VoIP Phone Systems, Avaya, WIN serving Cleveland, Akron, and most of Northeast Ohio. Samsung has won the flagship product for Raytec Systems. Below we will describe the OfficeServ 7030 system in detail. 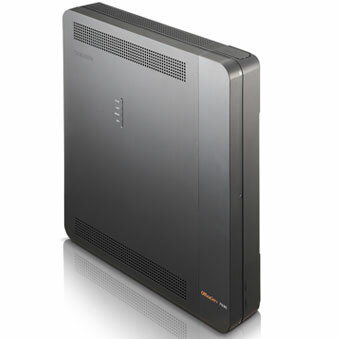 The OfficeServ 7030 is impressive in performance and price. A single, compact, feature-rich platform that integrates the capacities you demand–Voice over IP technology and wireless communications working together as one. A small company can now benefit from technology that used to be privy to only large corporate companies. The OfficeServ 7030 optimizes staff performance with such productivity-enhancing features as Auto Attendant, Caller ID with name and number, Uniform Call Distribution (UCD), Call Sequencing, Call Recording and more. The OfficeServ 7030 is available here through Raytec Systems, which means it is installed by our team of expert service technicians, plus a five year warranty. In addition, telephone user training is available by our team of specialists. Check the system specifications below to see if the OfficeServ 7030 is the right sized phone system for your company. Contact a Raytec Systems consultant for any further questions or pricing. *Please contact a Raytec Systems Consultant for more information. If the OfficeServ 7030 system is not large enough for your office needs, then take a look at the OfficeServ 7100 to meet your capacity and feature needs. For more information, Click on the Samsung OfficeServ 7030 product page on Samsung’s official web page.